Classes conducted in English take place on Sundays at UCS Senior School, Frognal, Hampstead, London NW3 6XH. The Summer term commences on 28 April 2019 and finishes on 7 July 2019 (26 May and 2 June 2019 is half-term break). We offer a 10% sibling discount on fees for a second child or further children. For the purposes of this policy the definition of a sibling is a child who is one of two or more children from the same family. The discount does not apply to whichever child has the highest fee spend, but does apply to siblings with an equal or lower fee spend. 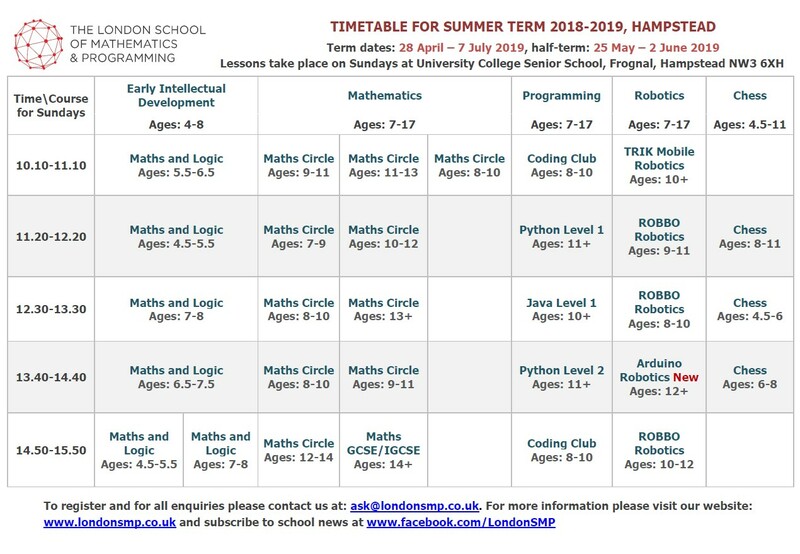 The Autumn term for all our schools starts on 14 September 2019 with our traditional Open Maths Olympiad at the High Street Kensington School. Regular Sunday classes in Hampstead commence on 22 September 2019 and finish on 8 December 2019 and are taught in English.